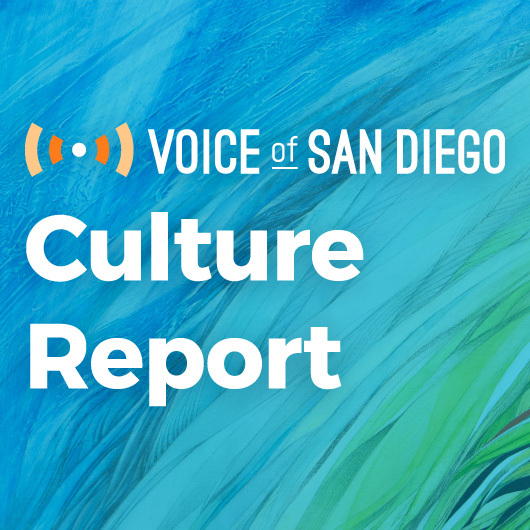 Yet another discussion about what plagues San Diego’s art scene, bench art takes on that infamous Barrio Logan fruteria and more in our weekly roundup of the region’s arts and culture news. 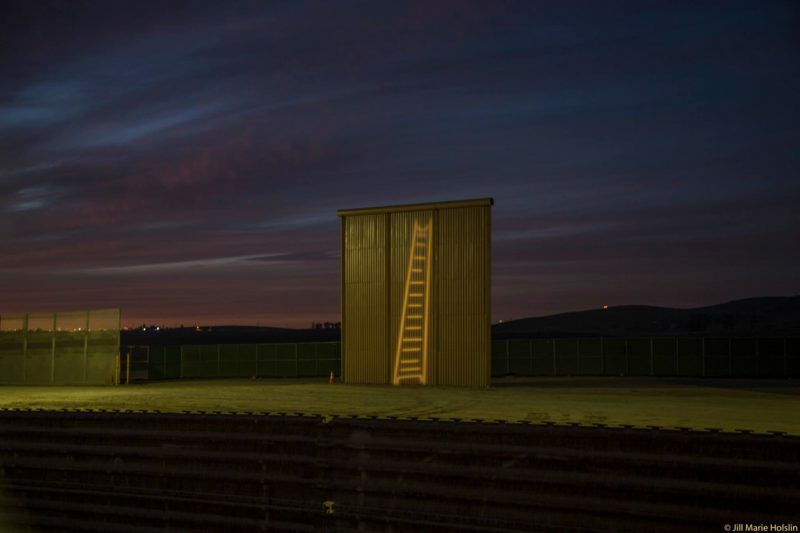 To artists, the eight border wall prototypes recently built in Otay Mesa look like blank canvases. As soon at the austere slabs went up, photographer and activist Jill Holslin knew she wanted to project anti-wall images on them. She teamed up with artist Andrew Sturm and the activist groups Overpass Light Brigade-San Diego and People Over Profits of San Diego. On Saturday night, about a dozen people drove to the Las Torres neighborhood of Tijuana. They parked near the existing border fence and stood on top of their cars and trucks and projected light through stencils, creating images of a human figure climbing upward with the word !LLEGALE! (a play on the words “illegal” and “come on in”), the mask of famed lucha libre wrestler Blue Demon, a ladder, the Statue of Liberty with the words “Refugees Welcome Here” and other messages like “Build Bridges Not Borders.” The whole thing took just under an hour. Tijuana-based freelance journalist Jorge Nieto was there, and made a video of the projections. Both the video and Holslin’s photographs of the projections, or “light graffiti,” have been viewed and shared hundreds of times. William Johnson, one of the founding members of Overpass Light Brigade, a group that’s done dozens of similar projects in locations across San Diego, said he hopes the imagery helps people see the wall as lffensive. 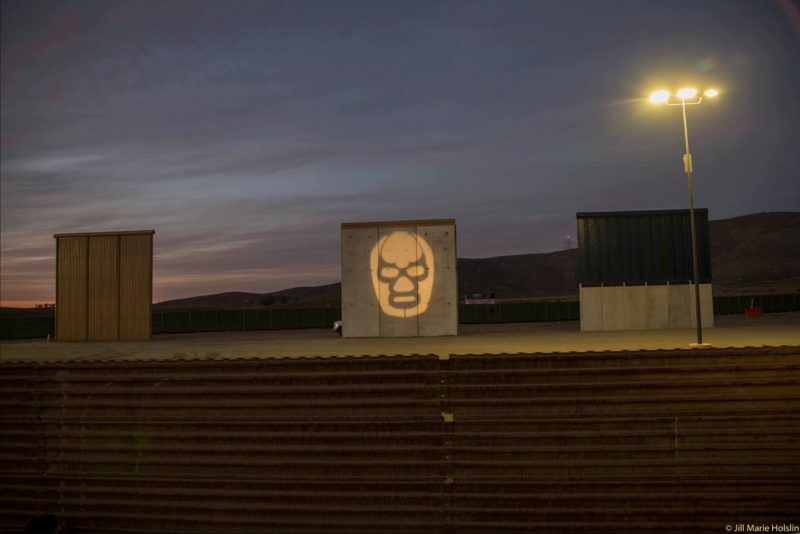 While big, chaotic protests over the border wall prototypes never materialized, the light graffiti project is part of a new wave of border protest art happening across the region. There’s a long tradition of protest art at the border that often tackles themes like immigration, human rights and binational policies. Johnson said he hopes more artists use the prototypes as a canvas for protest art. He think the images can help influence public opinion when it comes to the border wall. • Here’s a look at how the improvised border-themed mural that Hugo Crosthwaite and José Hugo Sánchez painted at the San Diego Art Institute turned out. Last week, I moderated a panel discussion about the lack of affordable space for artists in the region to live, work and perform. 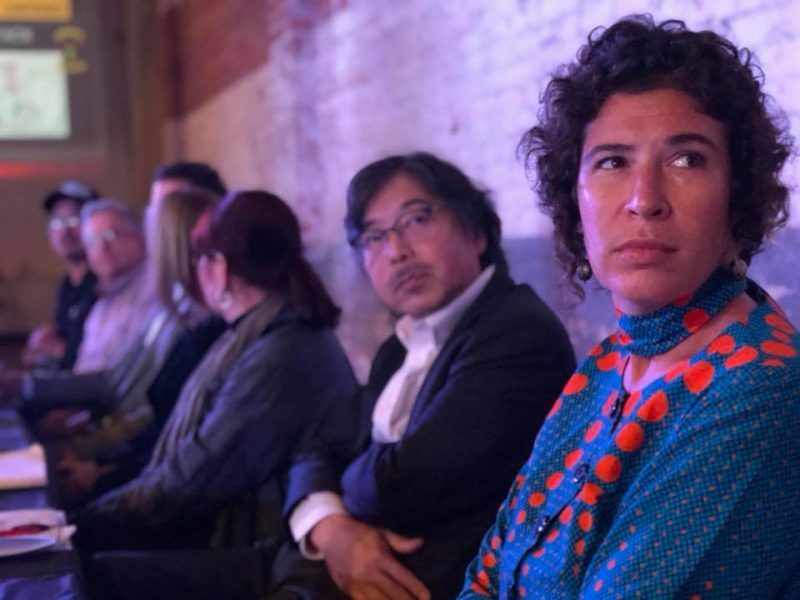 A few days after the talk, the Union-Tribune dug into whether the region’s underground art scene is dying. At the talk and in the U-T article, the same issues I’ve heard for years came up yet again: San Diego is too expensive, there aren’t enough serious art collectors here, artists need to get politically organized and collaborate more. ICYMI: I dug in to the 10 points that continually resurface in these types of talks earlier this year. You can listen to audio of the talk here. And if you want to weigh in on the conversation, you can fill out his form. Who knows, maybe this is the talk that finally spurs local artists to actually get organized and take action. • A DIY arts space in City Heights is raising funds to help it keep going. • CityBeat’s annual roundup of the “Best People in San Diego” includes several movers and shakers in the art scene like Andrea Chung, Dinah Poellnitz and Joshua White. • KPBS’s Nina Garin is out with her annual guide to the many different “Nutcracker” performances happening in San Diego. • In case you didn’t make it to the paper art exhibition I told you about in last week’s Culture Report, here are several photos of the event. • I took my first-born son to see kids perform “Elf the Musical JR” in Ocean Beach and it was good. • SDVoyager drops in on David Skelley, the guy with a good eye who runs the Boomerang for Modern shop in Little Italy. 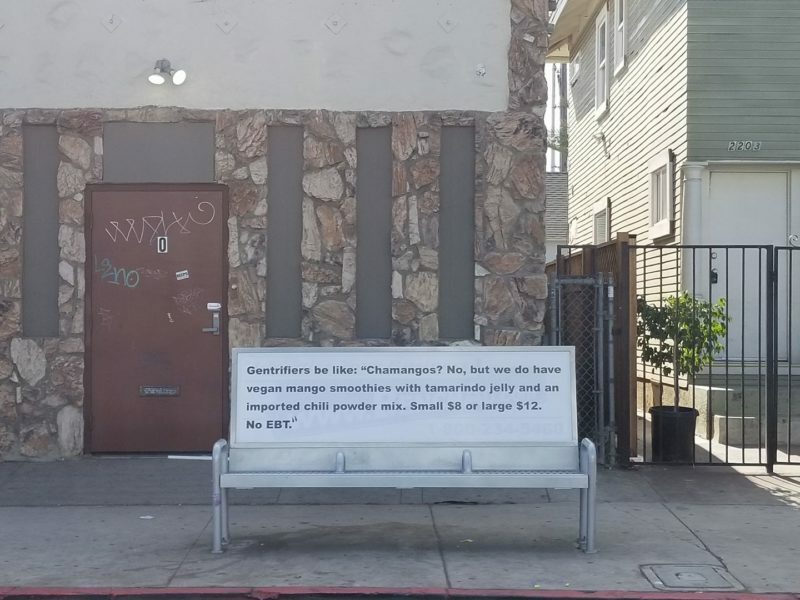 • Artist and musician Ramel J. Wallace snapped a photo of a bench in Barrio Logan that was temporarily altered by an unknown artist who weighed in on the modern fruteria that tried to open in the neighborhood, but was shut down after community backlash. Wallace says the city has removed the message. • Here’s a good explanation of why the San Diego International Fringe Festival and similar festivals exist, and what they set out to do for artists and performers who operate outside of a city’s mainstream art scene. • I loved this KPBS profile of twin sisters who work hard to keep the Old Point Loma Lighthouse at Cabrillo National Monument in tip-top shape. • San Diego Magazine claims this vegan taco is actually good. • Check out the first-ever Paradise Hills Night Market on Saturday.